A pretty female duelist, she came to the Duelist Kingdom tournament for the prize money and other selfish reasons. After meeting Yugi and the others, she starts to contemplate about letting her guard down and accepting them as friends. She duels Jounouchi (English name: Joey) once, Yugi once (in the Duelist Kingdom Semi-Finals), and Anzu (English: Tea) once. 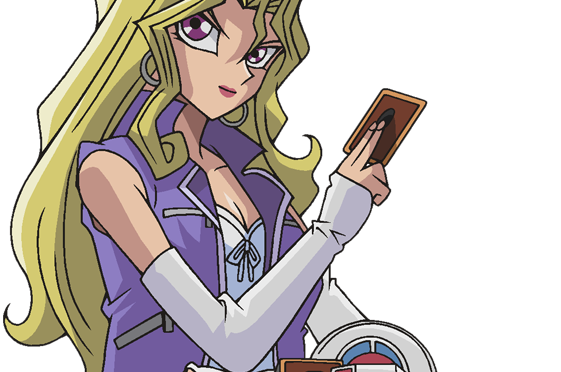 Mai holds the record for most star chips gained in the Duelist Kingdom tournament at sixteen, six of which she gives to Yugi to enter the castle after Kaiba defeated Yugi. During her duel with Jounouchi (English name: Joey), she starts to notice Jounouchi’s determination and dueling because he is dueling for his sister rather than material things. At the start, she takes the early advantage, ripping through Jounouchi’s earth-based monsters with her Harpy Ladies. She throws Jounouchi of his game mentally by pretending to be psychic while really she sprayed her cards with different perfumes. With Yugi’s help, Jounouchi notices this and defeats Mai with his Time Magician (English: Time Wizard) / Baby Dragon combo. Time Magician turned Baby Dragon into Thousand Dragon, and wiping Harpy Ladies off the field, Thousand Dragon took Mai’s life points down to 0. She cons Dinosaur Ryuzaki (English: Rex Raptor) into dueling Jounouchi for her, but Jounouchi defeats him and gains the powerful Red Eyes Black Dragon. In the Duelist Kingdom semi-finals she takes Yami Yugi by surprise and takes an early advantage. She reminds Yugi that he is thinking too much about Pegasus and to concentrate on their current duel. She attacks with various cards like Harpy Ladies, Harpy’s Pet Dragon and different magic cards. Yugi acknowledges her statement and annihilates through her cards with his answer to the Blue Eyes White Dragon, the ultimate soldier of legend, the Black Luster Soldier. Mai plays a decently big part in Battle City. Her duels aren’t covered as much, but she is now friends with Jounouchi, Yugi, Anzu (English name: Tea), and Hiroto (English name: Tristan). She loses to Malik in a Battle City duel. Since it was a Game of Darkness (English name: Shadow game) Malik inflicts a game penalty, and she has been unconscious ever since. Mai’s Duelist Kingdom deck basically revolves around her Harpy Ladies. This makes it a Harpy’s Theme Deck. She plays Harpy Ladies and uses various magic to boost them up. In Battle City she still uses Harpy’s Ladies, but also plays with her new Amozoness cards.